If you are getting the below error when you launched Firefox browser then read on how to fix this problem. The error says ‘Firefox is already running, but not responding. To open a new window, you must close the existing Firefox process, or restart your system‘. You can get rid of the problem by doing the following easy steps. 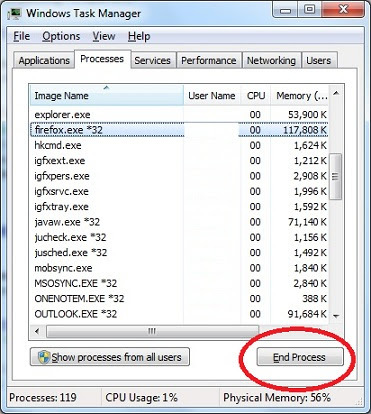 Click on Processes tab in task manager. Locate and select the process with the image name firefox(You can sort the list by clicking on image name if it’s not already sorted). 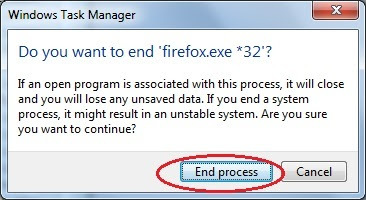 You will be asked ‘Do you want to end Firefox’? Launch Firefox browser now and it would open without any issues. This works once. If you close Firefox, and try to restart, the error appears again. You then have to run through these steps to start it. Happens every time. What I want to know is, how do you prevent the error from reappearing every time Firefox is closed and attempted to run again?